GTI supplies a diverse variety of interior packaging to protect products from the external effects of handing, transportation and storage. These include bubble pack in rolls and sheets, air pillows, styrofoam sheets, foam in place, foam loose fill (aka "peanuts"), foam blocks and sheets, Kraft and newsprint paper, packing tissue and poly-sheeting. We also carry anti-static and biodegradable inner packaging products. Air pillows provide a durable block and brace around your product and are a reliable cushioning material for light to medium weight products. The lightweight properties of the air pillows reduce shipping costs and because the air cushions are produced on demand they require minimal storage space. 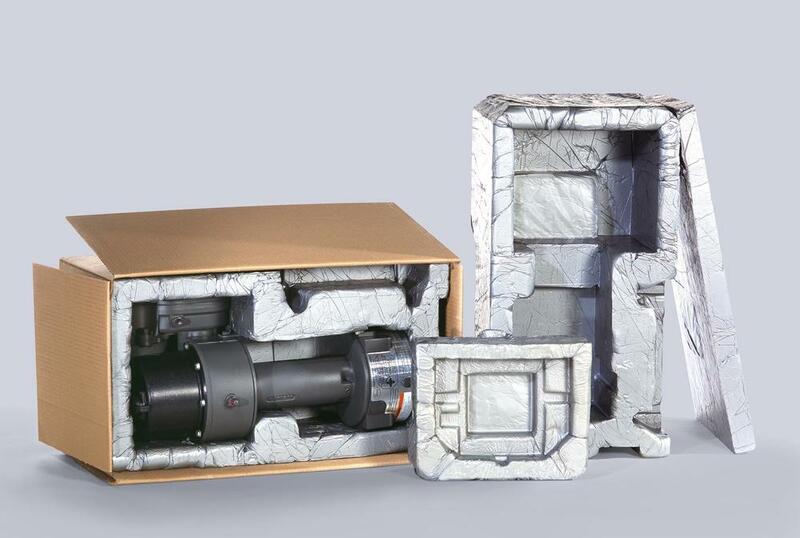 GTI can supply your company with a variety of interior packaging options to protect your products from the external effects of handing and transportation. Interior cushioning is used inside boxes to protect products during shipment. Bubble wrap available in rolls is most common. GTI carries large 1/2” bubble, medium 5/16” and small 3/16”, all in stock. All of our bubble is perforated every 12” and slit to the most common sizes 12”, 24” and 48”, so that it meets your specifications, making it easier for you to pack and ship. Styrofoam Sheets are used to insulate the inside or outside of foundations. The material can come into direct contact with the earth without any degradation over time. Sheets can be installed on the outside of wall framing or between the studs as is currently being done in areas where flooding has become routine. Unlike fiberglass insulation, Styrofoam Sheets absorbs very little moisture and as soon as the source is removed will dry out completely and quickly. Foam-in-place systems offer all the protection of foam during shipping, warehousing, and general handling. Easy-to-Use in minutes, anyone can become a packaging expert. Economically and efficiently protects products of almost any size, shape, and weight. Expands in seconds to form custom-fit cushions. Requires less storage space and reduces material handling compared to traditional packaging materials. Convenientpackaging for any size company. Your customer receives your product damage-free in a neat professional package. Loose fill packing peanuts are available in traditional EPS foam or a corn starch based environmentally friendly material, and also provide a cost effective way to fill packages for shipping. Contact us for information about our anti-static and biodegradable inner packaging products. Kraft paper is a 100% biodegradable natural product. The pulp is made from long virgin fibers of maritime pine and is not bleached, to ensure minimum chemical processing and to retain the wood’s natural color. Kraft paper biodegrades entirely naturally. Just like the leaves from the trees, kraft paper decomposes naturally within a few weeks returning to its initial form of cellulose fibers, which can be fully assimilated back into its original natural environment, with no adverse impact on nature or human health. Newsprint paper is an economical choice for stuffing void areas and protecting small fragile items. This unprinted white paper is made from 100% recycled paper that securely wraps and cushions items. A versatile paper used for wrapping, void fill, cushioning, and more. GTI stocks #1 packing tissue in sheets and rolls. Polyethylene foam is a strong and resilient closed-cell foam. Ideally suited as the material or a component material in shock absorbing products, this closed-cell foam padding is also a great way to dampen the effects of vibration. This makes it an excellent packaging material for items that may receive indelicate handling or require long-distance transportation. Polyethylene sheeting is a strong durable, multi-purpose plastic material. Water resistant, this plastic sheeting works great for protecting stuff from a leaky roof. The Poly Plastic Sheeting is widely used in construction and agriculture as a dust barrier in demolition, and to prevent soil erosion and protection of equipment in agriculture. It is also used for asbestos abatement to enclose and seal areas when removing asbestos. Applications: Job Sites, Boats, Insulation, Vapor Barrier, Equipment Cover, Insulation, Paint Protector, or Moisture Barrier, Etc.